Prolapsed – or ‘slipped’ or herniated – discs are quite common, and generally only a problem if the disc is compressing spinal nerves, resulting in back pain and sciatica, as well we associated symptoms like loss of sensation and strength in the affected leg.While it can take months for a prolapsed disc to get better, the vast majority of cases will resolve themselves with the help of conservative treatments, including physiotherapy and pain management. But a small percentage of patients may end up needing decompression surgery to relieve pressure on the affected nerve – often in the form of a microdiscectomy, where a small segment of the problematic disc is also removed. 1 Do I ‘need’ surgery? 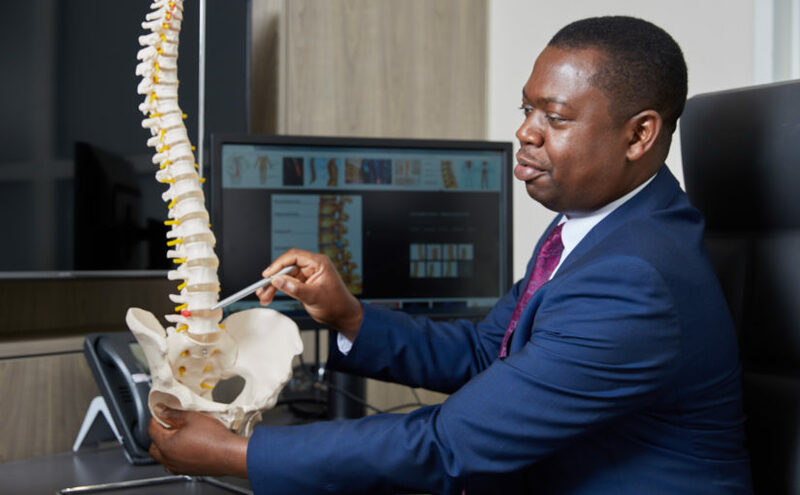 Firstly, it’ll need to be confidently ascertained that your symptoms are being caused by a faulty disc, as symptoms like sciatica can have a host of other causes too. MRI scan results, your symptom history, and how you’ve responded to other treatments will help your consultant make an accurate diagnosis. 2 Have I given conservative treatments enough of a go? Surgery is generally a last resort, when conservative treatments have been properly attempted over a period of time but haven’t been successful, and the symptoms are having a significant impact on your quality of life. Or, when the nerve compression is severe and there’s a risk of long-term loss of nerve function. In rare cases, surgery might be required urgently, if a condition called cauda equina syndrome – a very serious form of spinal nerve compression – develops. You can read more about this in our blog about disc prolapse ‘red flag’ symptoms. 3 Are there any risks involved? All surgery carries a degree of risk. Going under general anaesthetic has its own set of risks, and there’s always a risk of infection. With spinal surgery, potential complications could also include nerve damage. While risks are generally minimal, it’s very important to be fully aware of them. Our information video on possible spinal surgery complications explains more. 4 What sort of outcome can I expect? If your consultant agrees you’re a good candidate for surgery, while it’s never possible to give a 100% guarantee, there’s generally a very high chance of a very positive outcome, particularly where pain reduction is concerned. In terms of fully restoring any loss of nerve function associated with your prolapsed disc, this may vary depending on the extent of the compression and how long your symptoms have been present. Your consultant will be able to discuss this with you based on your individual circumstances. 5 How long is the recovery time? Most people are able to leave hospital within a few days, but you’ll need time off work to recover at home for a while. Providing your job isn’t too physically strenuous, it’s usually possible to return to work after about 3-6 weeks. It’s a good idea to talk to your employer about making a phased return, and how they can best support you during this time. After the initial recovery period, physiotherapy and rehab can help support your recovery further. 6 Will I be able to return to full fitness? Yes – returning to fitness is a very important part of the process. Being strong and active can play an important role in avoiding future problems, but you’ll need to approach this with expert guidance of course. As mentioned above, once you’ve suitably healed from surgery, you can start with light exercise and physiotherapy, before stepping up your rehab. Pilates-based exercises are great for building up your core strength, and a spinal rehab specialist will be able to guide you on gradually increasing your activity levels. Our blog on returning to exercise after spinal surgery has more information on this.Would you like to find out more about spinal decompression or microdiscectomy surgery? Our specialist team is here to help – book a consultation via our enquiry form or call us on 020 3950 2409.